Bloomerang Dark Purple Reblooming Lilac blooms in spring like traditional lilacs, then reblooms in summer and will add beauty and fragrance to gardens from spring to fall. Bloomerang Dark Purple Reblooming Lilac from Proven Winners grows fragrant purple flowers in spring that rebloom in mid-summer and continue through fall. Prefers full sun (6+ hours) and moist, well-drained soils. Grows to be 4-6 feet tall and wide. At time of shipment, this plant will be about 6 months to 1 year old. Blooms in spring and reblooms in summer with purple flowers. Quart shrubs are 5-10 inches tall when they are shipped, depending on the season. Hardiness zones: 3-7. Be sure to check your USDA Hardiness Zone if you want this plant to come back year after year. 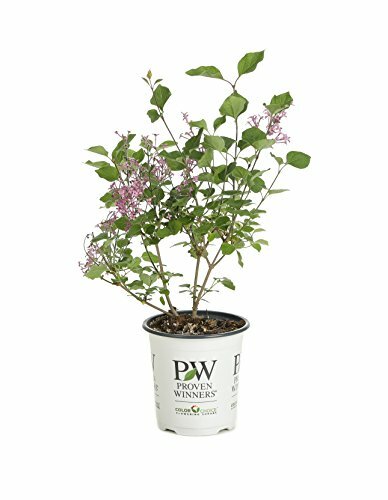 This lilac will add fragrance and beauty to containers or as part of a landscape. Use the blooms as cut flowers to bring the lilac scent indoors. Snake Plant Black Coral, 6"